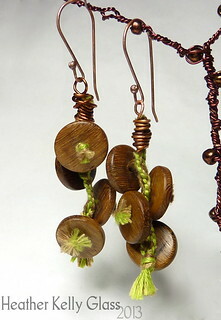 These earrings use the same 8-thread shippou kumihimo pattern as the last pair, but done the right way round this time! They were also one of those pairs that require sitting around, staring at them, procastinating a bit, staring some more… until an idea arrived of what design to go with. I didn’t want to thread wire through them again, since although that gives a solid framework to hang beads off, it also stiffens the braid up. The braid is again quite thin and splits in two to make a loop, joins together, splits again, and is made of soft embroidery thread so I didn’t want anything heavy that would fray it. 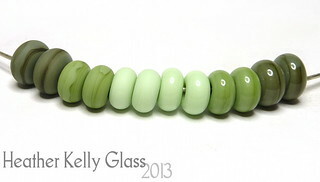 I had some assorted green lampwork beads out from the last pair, but lampwork is comparatively heavy. 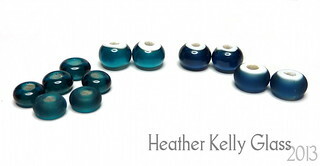 Then my eyes alighted on these big but very light wooden disc beads. Just right! I took a strand of each of the three colours of embroidery thread that are in the braid, made a knot on the end to hold the wooden disc and threaded it through the loops in the braid a couple of times, coming out on the opposite side and knotting on the other disc there. I cut the threads fairly close to the knots and squished the cut ends so they fan out like little fronds. Repeat for the other disc pairs. 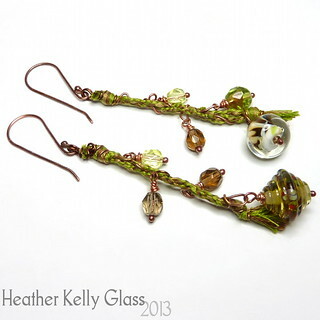 The tops are wire-wrapped with flame patinated copper and hang from copper earwires. One of the goals I had for this challenge was to try some asymmetric and non-matching designs, which I find really difficult! 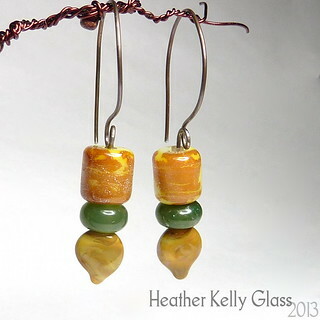 Easing in, these earrings have different beads. 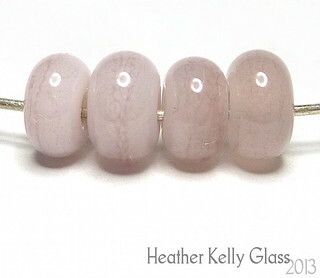 I’d picked out the lampwork beads I wanted to use, and decided to spiral some copper wire through the holes rather than wiring the beads directly onto the braid, making loops for the beads to hang from. I figure this will cause less wear on the thinner braid sections over time. 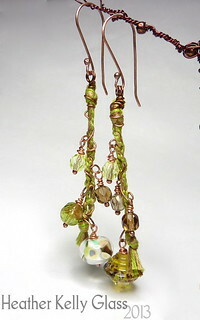 I added some Czech crystals in green, brown and yellow-green to dangle from the higher up loops and made copper earwires. To test the striking colours in circumstances where they’re more likely to strike, I made pressed lentil beads. Bing: has opacified a bit more. You can see the mandrel hole, but I’d list this as semi-opaque. Tandoori: has struck much oranger and has gone cloudy. (Though slightly unevenly at one end, which is lighter than the other). I also did a bead with psyche scrolls on tandoori – the psyche shows up as dark blue with plenty of shine and the tandoori has darkened more. 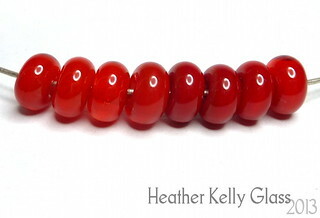 Here’s a close up of the tandoori beads. Next I tested mint chip with copper green and psyche. The mint chip has gone a bit streaky under both of these, but more so with the psyche. The copper green has done its thing where it goes darker in the centre with a pale halo, but it has also greyed up a great deal. Psyche has fumed the base yellow and is showing up as brownish purple. That’s fairly expected. Here is psyche on the other neutrals. Cake batter has stayed very clean-looking and has only been fumed a very small amount. The psyche appears very brown. Antique Lace is a bit streaky, has stayed a pinkish brown and the psyche is fairly brown. 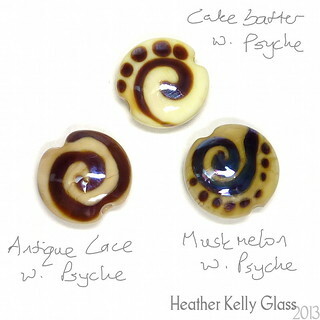 Muskmelon has gone streakier and fumed darker, and the psyche has blue hints. This seems the most reactive base out of the three. A pair with a lot of motion this week! 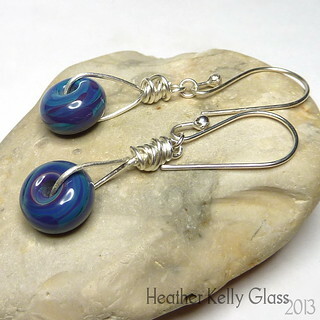 These have a pair of my lampwork beads in a striking silver glass that goes all shades of blue, purple, and a bit of green. 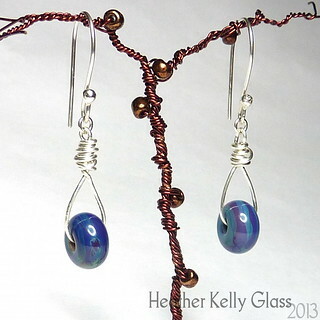 They are wire-wrapped in sterling silver and swing and dangle about freely. Here are the reds, oranges, pinks and neutralish colours. Front to back: daffodil, alley cat, tandoori, bing, radio flyer. Frangipani, antique lace, cake batter, musk melon and weimaraner. 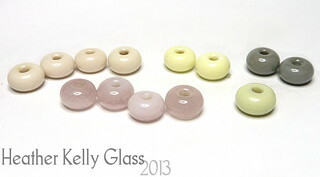 Here are the pinks and neutrals all laid out. Frangipani at the front, antique lace is the pink-tinged light colour, cake batter is the yellowish and musk melon the greenish. Weimaraner is a blue-tinged grey. All three of the light colours are pretty, subtle, clean shades. Frangipani was previously Unique Crocus-2. How much it opacifies varies by how much you cool and reheat it. It got some surface mottling which is rather pretty. If you don’t want it to do that, you may be able to avoid it by working cooler. Weimaraner as spacers is a fairly uniform colour (remember the goblin brought out more dark lines from the sculpting). Blue-grey rather than green-grey or brown-grey. Now for the reds. Bing is much more transparent, with some mistiness evident inside the spacers, but you can still see through to the mandrel hole. Radio flyer is a semi-opaque: you can’t see through it, but you can see just inside the surface, giving it a very glossy look. It is a somewhat deeper, cooler red than bing. The difference is a bit more obvious above than it is when they are put on a wire. 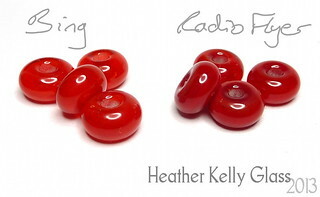 I will be making lentil beads from the striking colours, because that’s a better way to see how they look when heated and cooled more and in higher volume. I have a suspicion that Bing might become mistier still. The oranges. 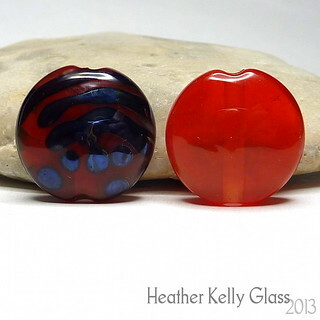 Daffodil and alley cat both strike a little, even in spacer-sized beads so you can see some variation across the surface. Daffodil is a pretty yellowy orange and alley cat is exactly the right shade of marmalade for making cats! I like both of these a lot. (My camera does overdo the orangeness, so I had to adjust the colours in these a bit – they appear more accurate to me now). 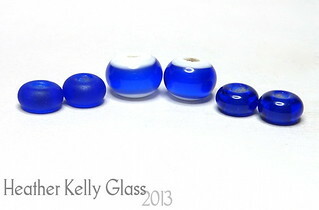 As well as the lentils, I want to test various of the opaques with silver glass. And maybe break out the copper green. 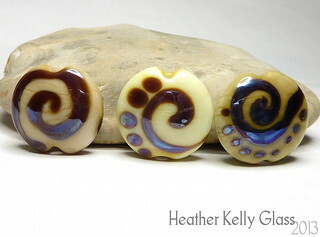 For these earrings, I used a pair of my lampwork headpins to make the entire earring. These headpins were small golden brown leaf shapes on stainless steel. 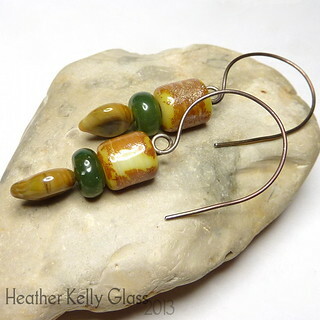 I added a pair of green Indian agate rondelles and some little lampwork cylinders with silver leaf melted in to them, gave the headpin a little spiral loop to secure the beads and formed the tail into a big rounded loop for the earwire. I left the stainless steel heat patinated from the kiln as it went better with the warm colours that way. (I could have given it a quick rub with micromesh to polish it back up). My stainless steel wire is 0.71mm so a little thinner than my usual 0.8mm earwires. I have some CiM to test! This is the first half, covering the greens and blues. The next lot are reds, oranges, pinks and neutralish colours. 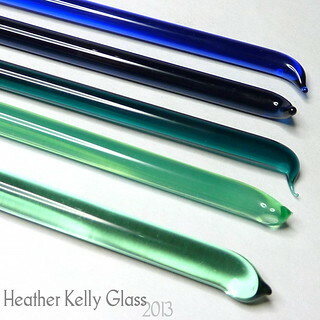 Here are the transparent/translucent greens and blues in rod form. 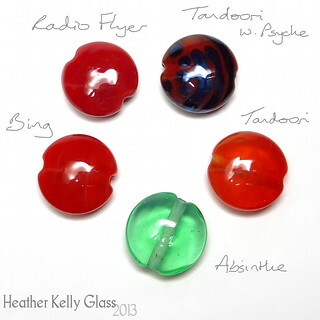 Front to back: aloe juice, absinthe, Tuscan teal, trade winds and neon blue. 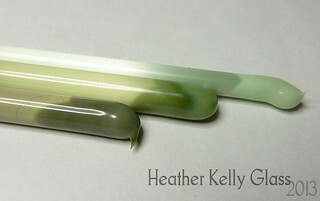 These are the opaque green rods. Goblin, shrubbery and mint chip. 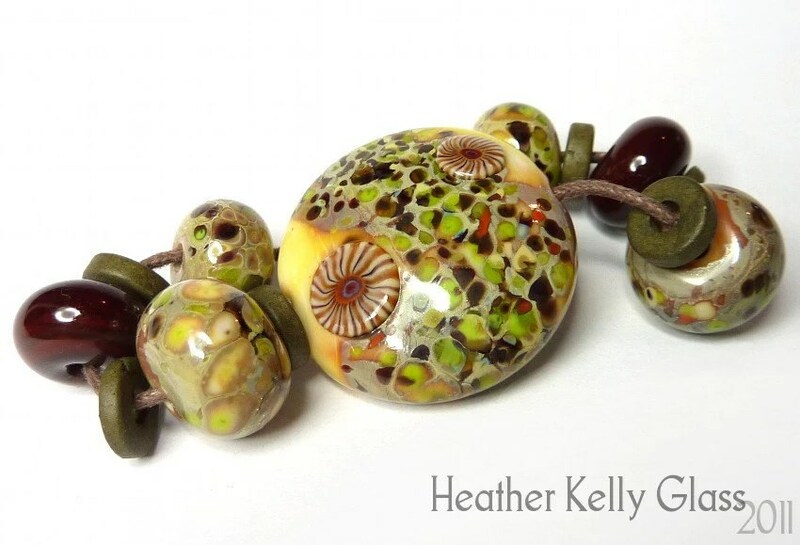 I mostly did small plain beads for this pass of testing, just to see how the colours came out and how they were to work. In small spacers, they looked very similar. Aloe juice is a very pretty transparent green, nice to work. Absinthe is an opal/translucent and it appears it takes a bit of effort to make it do that. It has the slightest hint of mistiness in the spacers I made, and is a tiny bit darker than the aloe juice, though that is more obvious when both are larger. Absinthe is also a much softer colour that likes to spread along the mandrel. It either doesn’t etch at all, or needs a lot longer in the etching liquid. The little spacer at the end was the etch attempt. Aloe juice etches well for a sea-glass look. Tuscan teal is a lovely deep teal, not too green, and is not so dark that you can’t use it on its own in spacers, but also looks great over white. (I am using Effetre white in all these). Etches fine. Trade winds is a very dark midnight denimy blue. I didn’t do plain spacers with this, they would have just looked dark. Again, looks great over white and etches. Neon blue is similar to cobalt, but is a slightly different shade. It is surprisingly soft for such a saturated blue. Etching makes it seem very slightly purpler. It stands out very well on top of white. I am keeping an eye on these because one of the ones over white has a crack, but there was also a brief power cut when the kiln had nearly finished ramping down, so I can’t be certain if there’s any problem there. 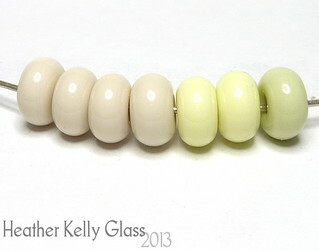 The second bead has no cracks yet, and I did an unphotographed test of it over CiM peace the next day too. I like these greens sitting side by side like this! 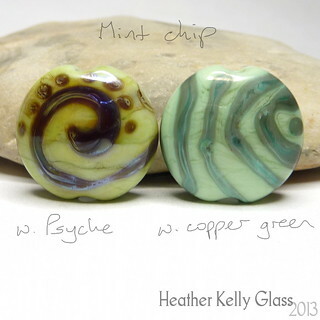 Mint chip is a beautiful pale opaque green. There have been a few of these from CiM with slightly different shades – sprout, for example, and I don’t have them side-by-side to compare right now. Mint chip goes by its name well – it is a pretty minty green, no yellow tinge. It also has a very smooth uniform colour, no darker lines. Shrubbery is a mid, yellowish green. I wouldn’t quite call it an olive, but it’s getting there. It does have noticeable lines where the colour has been applied. I like goblin a lot. 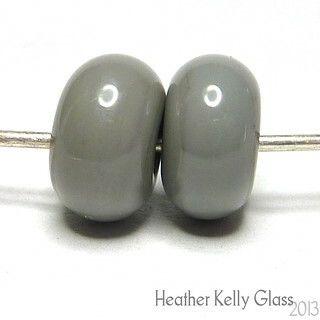 It is a dark olive colour with dark lines that is deep and shiny on its own and softer when etched. Good for organics and leaf tones, I would think! The rod was a bit shocky though – if you look up at the rod photo, you can see it’s cracked just above the dark line where the most heated section stopped. 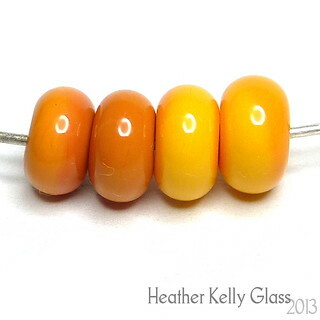 When I was doing my sculptural bead below, I had to baby it back into the flame every time I picked it up again, or it was shocking off along there and losing a significant chunk of glass. I only had the one rod, so I can’t say whether this would happen with all of them. Here’s a pic on side so you can see the streakiness or lack thereof better. 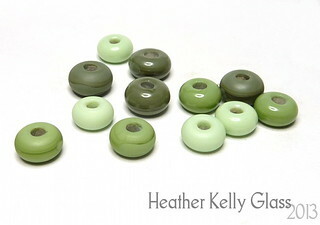 Then I had some fun and made some goblin beads! (Using my dragon eye murrini). These are grumpier than gremlins and have much bigger TEETH. Goblin, shrubbery and Weimaraner (of which more next time). The colours are darker in places when worked like this: they go in and out of the flame a lot and have heat directed at specific areas, which brings out the darker lines. You can see a little bit of reduction here and there, particularly near goblin goblin’s eye. I like the gnarly look on these!